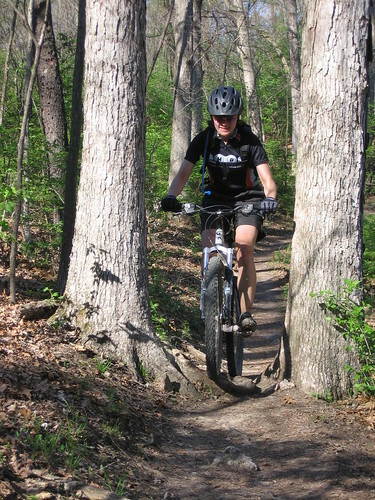 With nearly 17 miles of trails, Castlewood offers some of the best variety of riding in the area. From the flat and curvy along the Meramec river, to the numerous climbs and downhills on the bluffs, there's something here for everyone. 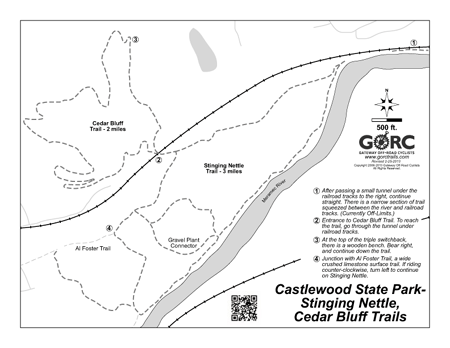 The trails can be simplified roughly into two categories: the easier, flat trails along the river bottom such as the River Scene, and Stinging Nettle; and the more advanced, technical ones in the higher areas including Cedar Bluff, Lone Wolf, the Rollercoaster and Grotpeter. 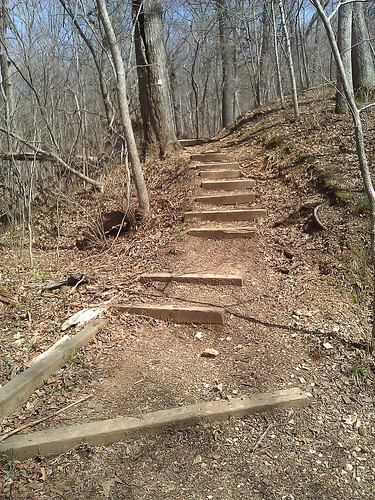 There are several shorter trails- Mountain Ridge Connector, Ranger Station, and Justin's, which link parts of the main trails. If you're unfamiliar with the park, a map will be very helpful. Trails along the river bottom are fairly slow to dry, while the higher, rockier ones are more durable and dry more quickly. 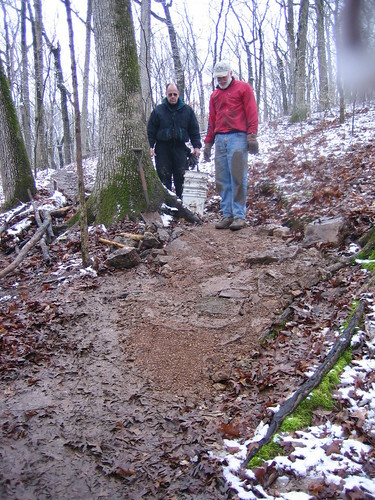 It would be wise to avoid most of the trails after rain, but this park sees such a high volume of trail use that there is generally always someone out on the trails, no matter the conditions. 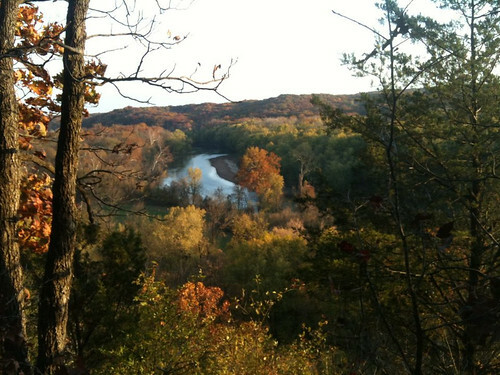 Castlewood is one of the busiest, and most popular parks in the area, so you might find yourself sharing the trails with families out for a picnic, hikers, birdwatchers, runners, equestrians, or cross-country mountain bike racers. Be extra careful on nice weekend days, as the park will most likely be extremely busy. 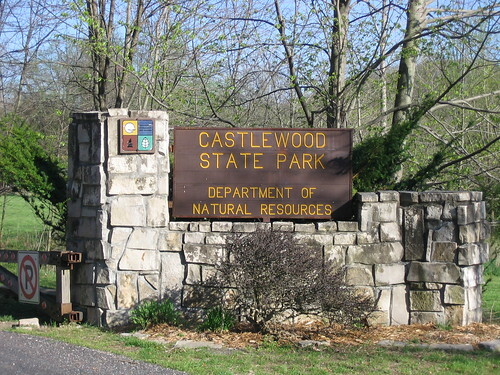 Castlewood is outside St. Louis near Ballwin, along Kiefer Creek Road. Take Hwy 141, Meramec Station Road, until Big Bend exit. Turn west onto Big Bend. Big Bend turns into Oak Street. Turn left at Ries Road. Go over the hill and turn left at the Castlewood sign. C-Wood is in great condition... The bottle neck to Bluff/Zombie is now usable. Love and RC great this morning. 2 large trees down on RC. Going clockwise from the start of RC a big one about a 1/4 mile in. The next is not as big but hanging off the ground a little ways before the emergency G location ..
Great conditions. Was lazy today so just did mostly flat stuff. River still over the narrows on stinging nettle so I couldn’t go past there. Few wet spots on flat trails, but all avoidable. Small tree down on start of Roller Coaster. Trail was starting to thaw where the sun was hitting the ice on the trail. And it was only 14 degrees which surprised me.